Freightliner Trucks has a commitment to improving the fuel efficiency of its trucks every two years. Danny Borski, the manager of fuel consumption testing at Freightliner Trucks, and his team of engineers and technicians perform fuel economy tests to validate this improvement, both on the road and in simulators. Most recently, Borski oversaw the fuel efficiency tour for the new Cascadia, which was an on-highway cross-country fuel economy test that compared the 2016 Cascadia Evolution to the new Cascadia. Historically, Freightliner conducts a major cross-country tour like this every three or four years. Often they are timed to coincide with a significant new product launch. The cross-country fuel economy test is the culmination of thousands of hours of research and development aimed at getting the most out of a gallon of diesel. Here’s an inside look at how the fuel efficiency tour for the new Cascadia was developed, conducted, and reported. Q: How was the route for the new Cascadia fuel efficiency tour developed? Borski: We develop the route by mimicking our drivers’ behavior. We looked at a dozen different potential scenarios and picked the Detroit to Portland route because it was the most representative route for our customers based on the data and customer feedback. We have a driver simulation tool that helps us develop and pick the route before running it with the vehicle, giving us an indication of what we should expect from the truck. We monitor all of the data live, including how the engine and transmission are performing, and that helps us plan ahead for the fuel efficiency Tour. Q: Which types of terrains are covered in the fuel efficiency tour? Borski: During this tour, the trucks drove through pure flats in Iowa, a long steady climb through Wyoming hitting an elevation of 8,000 feet, rolling hills through Utah, a steep drive up and back down into Oregon, and then a steady flat. We wanted to make sure we hit all different types of terrain. The tour also included days with high wind and days with a cross wind, because we wanted to capture how the vehicle would perform in various weather conditions. Q: How do you ensure that you’re comparing the vehicles apples to apples? Q: How do you conduct the tour before unveiling the new truck? 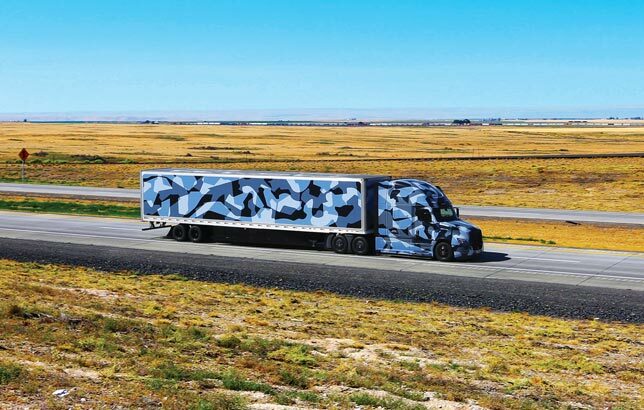 Borski: Since it was before the launch to the public, all three trucks and trailers were required to be camouflaged. Needless to say, we received a lot of attention at truck stops. The third vehicle was a full tractor trailer that was logistically placed in between the two trucks. That was a current Cascadia pulling a test support trailer, not part of the actual test, but it was critical to the test. Q: What’s inside the test support trailer? Borski: The test support trailer is custom made with live wireless communication with the test trucks and data being broadcast from both trucks to the trailer. Inside the trailer is my team of engineers, who can view and process the data for both trucks. Throughout the whole trip, we rode inside that trailer to make sure we didn't have any issues and both trucks were doing the same thing at the same time. Q: What was your fuel efficiency goal for the new Cascadia? Borski: The target was a five percent improvement, but going into this tour, we knew that we were going to exceed that because we had been running individual tests on all of the different components. We ended up with an eight percent improvement in fuel efficiency when comparing the two trucks. Q: How did you achieve the eight percent improvement in fuel efficiency? Borski: There are about 12 new features that contributed to this eight percent improvement, including Intelligent Powertrain Management (IPM). The biggest one alone was aerodynamics at 2.5 percent. And these are features that our customers can get today on the new Cascadia. Q: How did you ensure that the data gathered was accurate? Borski: We had an independent test observer for the entire truck prep and tour. They traveled with us and certified the weights and test equipment. The independent engineer verified all of the data captured at every stop, including the fuel reading and fuel devices, and kept track of variables like tire wear and trailer weights. At the end of the tour they signed off on our findings. We wanted the tour to be a real-life measure of what our customers can expect. *The fuel efficiency tour compared the 2016 Cascadia Evolution with an Integrated Detroit™ Powertrain (IDP), GHG14 DD15® engine, DT12™ automated manual transmission and 2.41 direct drive axle ratio, to the new Cascadia with AeroX, IDP, GHG17 DD15 engine, DT12 with IPM4 and 2.16 direct drive axle ratio.